When it comes to home exercise equipment, there are so many different options to consider. Exercise bikes have long been one of the most popular machines for use in the home, but the simple fact is that they are not suitable for everyone. Fortunately, there is another option that is more suitable for the general population and that is the recumbent exercise bike. These bikes are designed to allow extra comfort when cycling. 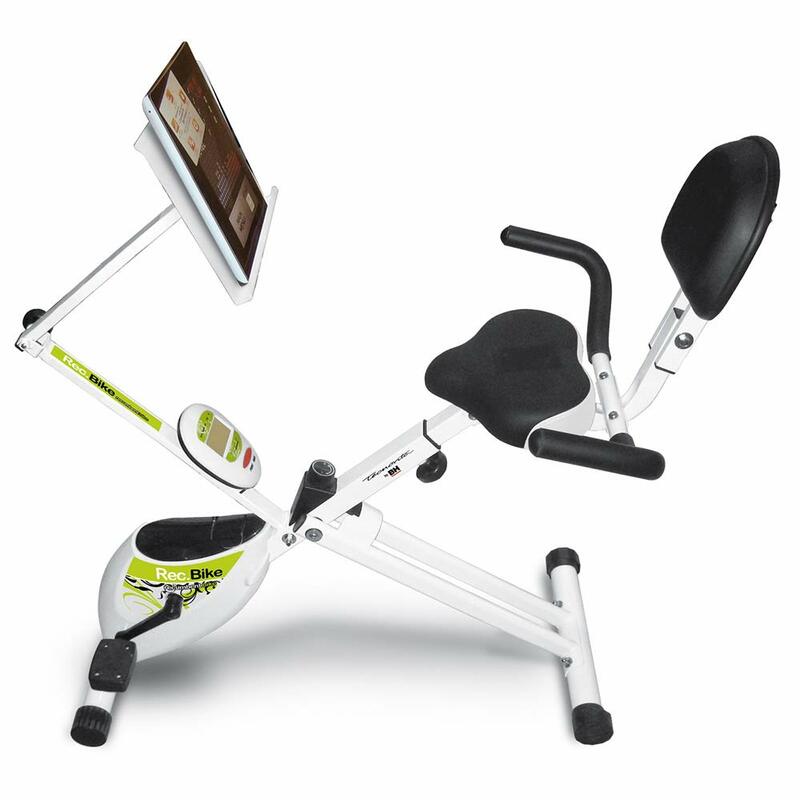 They almost resemble a cross between an exercise bike and a rowing machine. The good thing about the recumbent exercise bike is that it is easier on the joints so it is perfect for those who are particularly unfit and require extra comfort. If you are considering buying a recumbent exercise bike, then you will likely already be aware that there are a lot of factors that need to be considered. In order to save you some time, we have done the research for you and tested and reviewed our top 5 models. Please read on to learn more about our verdicts. It has an incredibly solid frame. The seat has sweat resistant fabric for extra comfort. Suitable for all heights thanks to the adjustable seat. The programs are almost gym standard. Assembly does take quite a long time. This recumbent exercise bike is quite expensive. with this recumbent exercise bike are not exactly great. We found them frustratingly difficult to follow. However, after looking online, we were able to assemble the entire thing, but it did take us around two hours so this is worth keeping in mind. Onto the actual design and performance of this exercise bike; we have to say that we were incredibly impressed. The frame of the bike is very sturdy. We didn’t experience any unwanted movement when working out. In terms of noise, the bike is relatively quiet. One thing that really impressed us was the quality of the built in programs. After working our way through all 18 of them, we were happy to learn that they are incredibly close to gym standard. We were equally as impressed with the 16 levels of resistance. With this much variety you are really able to push yourself. Another thing that we were pleased with is the adjustable seat which you can move backwards and forwards a great deal, making this recumbent perfect for people of all heights. Although this exercise bike is more on the expensive side, we definitely felt that it was worth it. Very sturdy frame with no wobbles at all. Easy to switch between the monitoring functions with a dial. Good variety of programs to choose from. It isn’t gym standard, but its good value for money. Number 2 on our list goes to this recumbent exercise bike from Kettler. We have tried out their machines before and always been pleased with the results, so it was no surprise to us that we were impressed with this recumbent. Before we go onto what we liked, there is one issue that we should definitely mention first. After taking a good look through the instruction manual, we honestly felt that it was totally useless. Trying to follow it to assemble the bike is impossible. We had to look online to find out how to actually assemble everything and work the bike which was a little disappointing given the standard of most Kettler machines. However, although there was this minor niggle, it doesn’t take away from the fact that this is a very good basic recumbent machine. There is a nice selection of programs to choose from, and switching between the different monitoring functions is easy with the dial on the screen. The frame of the bike is incredibly sturdy and comfortable and we definitely felt that we were able to get a good workout with the 16 levels of resistance. It isn’t gym standard, but it is a good second best. Very impressive number of built in programs. Plenty of levels of resistance to increase intensity. The frame feels very sturdy. The seat could be a little more comfortable. NordicTrack are one of the leaders in home fitness equipment, so we weren’t really surprised that we wanted to add this recumbent to our list. They consistently produce high quality workout machines and this exercise bike is no exception. To start off with, the instructions were crystal clear and the assembly didn’t take us very long at all. The frame, once assembled, felt incredibly sturdy as we would expect with a brand of this standard. One thing that really impressed us with this machine is the sheer amount of built in programs to choose from. With 32, we were able to really vary our workout routines. There are also more levels of resistance to choose from than you would usually get too. The LCD screen is very bright and easy to see and we had no trouble switching between the different monitoring functions in order to see our progress. The only issue that we did have is that the seat isn’t very comfortable if you use the bike for prolonged periods. However, this could easily be remedied with some extra padding. Overall, we were very impressed with this recumbent exercise bike. If you are looking for a recumbent from a reliable brand then this is one that is definitely worth considering. Oversized pedals add extra levels of comfort. The extra deep padded seat adds extra comfort. The LCD screen is fairly easy to see. The seat isn’t adjustable enough to accommodate for taller people. Assembly is a very lengthy process. built a good reputation for themselves over the years, so we weren’t surprised that we liked their recumbent exercise bike. The first thing to note is that the assembly is a very lengthy process. It took use two and a half hours to get everything set up and ready to use. oversized pedals which make exercising a lot easier. The only negative aspect is the fact that the seat doesn’t really adjust enough to accommodate for taller people which is a shame. The LCD screen is easy to read and switching between the different functions and resistance levels is very easy to do. The heart rate monitor is a little unreliable but this is to be expected with a machine in this price range. Although this is a very basic machine, it is perfect if you want something affordable and easy to use. Foldable so perfect for those who are lacking space. Very easy to operate so it is a good beginner model. The frame feels a little on the flimsy side. The maximum user weight is a little low. Starting off, the assembly process was very easy indeed. We had the bike set up and ready to go in under an hour. One thing that we really like about this recumbent exercise bike is the fact that it is foldable and it is incredibly easy to store in small spaces which is a definite plus point. The only drawback is that the frame feels a little flimsy. The maximum user weight is a little low in comparison to most of the other models on the market at the moment, so if you are heavier then you might want to look into your other options. However, the bike itself is very easy to use. We were also impressed by the lack of noise when working out. Although this is a very basic bike, the functions are incredibly easy to use and we had no difficulties at all, so if you are looking for a bike that is basic, easy to use and affordable then this is a good option to look into further. We hope that now that you have read through our reviews that you are able to make an informed decision on the best recumbent exercise bike for you and your needs.